many times it have asked me how to do a swirl. Here it is the swirl tutorail. Enjoy and educate. I'm going to learn you how to make from this cactus a cactus swirl. When you have made that. Group it all together. To group it select the basic of the swirl and you will see 4 arrows pointing to each other, click it and then the basic is together. Duplicate time!! Start as tiny as you can with the basic and do the next layer underneath it. Do the second layer with an other colour so you can see where the layer is. And for a good effect make it a little bit bigger. To make the other layer white pres the square that is half black half white. Tip: if you have select the layers press "D"it will duplicate himself! and for the "themepackers"use differnet colours !! Done is your swirl. If your browser is slow when you are working on your swirl is to big for your browser and then you must finish it so quickly as you can and publish it. i figured thats how you did it...but now the cat's outt'a da bag! Yes, a bad habit I know. You know you are answering your own question. 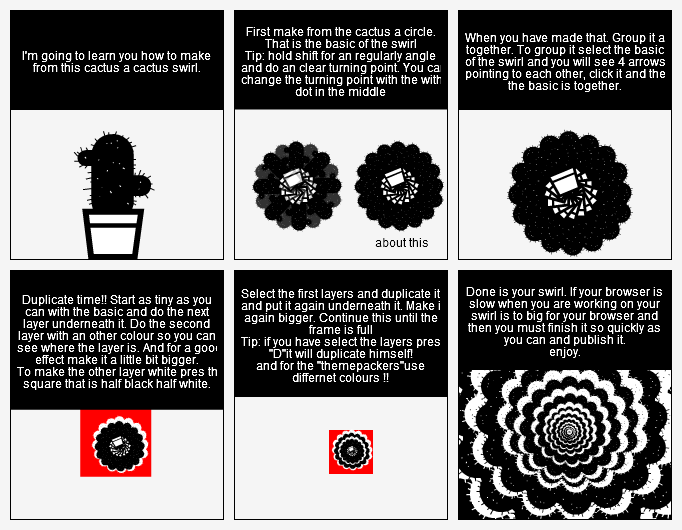 @Ambrosius yes press the D when you have selected the cactus only the turning is the slowest part. But I think you know that trick either. Is there a fast way for the second step? that would be useful for the iris textures too.